Raise your hand if you fondly remember Rosebud when it was just a grungy old diner. Well, grungy no longer - it's completely redone, expanded and packed to the gills with hipsters. I went last weekend with one of my bridesmaids, Christine, and one of her friends, Wendy. I even managed to convince them to try the Asian barbecue hogs head, only to be told they had already run out. Really? It was only 8 o'clock on a Friday. So, instead we shared the dry fried green beans ($10) at the request of Wendy who wanted some vegetables, the fried chicken thigh dinner ($16), BBQ meatloaf ($16), mac & cheese ($5), and a ½ and ½ rings and fries side ($7). 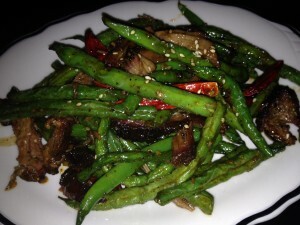 The green beans came first and they were sautéed with shreds of smoked pork shoulder that were unbelievably salty. 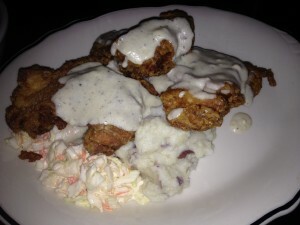 The fried chicken thighs were delicious. The chicken was fried perfectly and well seasoned. At $16, it put Merrill and Co’s chicken from last the weekend to shame. 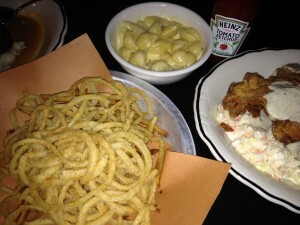 The mashed potatoes was comforting and creamy, but the slaw was uninteresting. The meatloaf was awful. 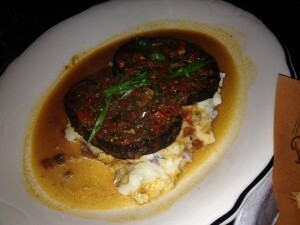 Literally, the worst meatloaf I have ever had. It was a chewy compact puck of extremely salty meat - Borderline inedible. The pasta in the mac & cheese was pleasingly al dente, but the cheese sauce was shockingly bland given the salt content of the rest of the meal. I found myself mixing the mac & cheese and the shreds of pork shoulder to create some form of balance. The onion rings were excellent, the fries were mediocre. We picked around the fries to get the last of the rings. 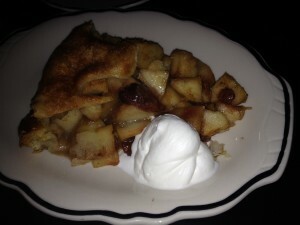 Rosebud features homemade pies and had five different ones available. They also sell them whole for $36, which is somewhat akin to highway robbery. People should just go to Petsi’s down the street instead. That said, our slice of apple, cherry and ginger pie was delicious; the crust was tender and flaky and favor was feeling pleasingly balanced. Our service was decent and I would return to try the whole hogs head dish, but only if they promise not to kill it with salt.